305 MEMBERS. 18,352 HOURS EXCHANGED. Reclaiming our local economy one exchange at a time! 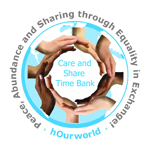 Interested in joining the Care and Share Time Bank? First, watch the following video recording of an “orientation” meeting to the time bank. Second, take notes with any questions you may have. Third, send an email to Michael Greenman, CSTB Coordinator, to arrange the completion of your membership application. Looking forward to having you be a part of our CSTB community! If you are a CSTB member, please sign-up for / request to join our online conversations! CSTB Affiliates: Partners in Your Community!